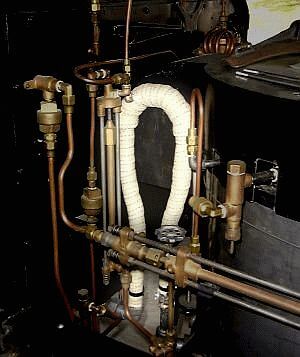 Connected between the superheater and the steam pipe to the engine, and located between the boiler and the firewall is the steam loop. This simple, well insulated, inverted U-shaped loop of pipe performs several functions. The U-shape of the loop give the steam line between the engine and the superheater some flex area to help prevent breakage of the line caused by movement due to expansion when heated. Steam cylinder oil is injected into the rear leg (the fitting can be seen in the photo) of the loop for mixing with the steam going to the engine and thus the steam loop prevents cylinder oil from getting into the superheater and getting burned. Located after the superheater and before the steam supply line to the engine the steam loop traps any condensate that accumulates in the superheater. On firing up the car the steam loop keeps the water in the superheater helping prevent super heater melt down. The water has to be transformed into steam in order to exit the superheater. And finally the steam loop breaks up slugs of water that may get past the throttle and are not flashed to steam by the superheater. What water escapes past the superheater is resisted from further movement by the vertical leg of the steam loop. As shown in the photograph above the steam loop is insulated to limit the radiation of heat to the air. The complete steam line, from the superheater under the boiler to the flexible coupling to the engine is insulated. In addition the steam line between the throttle and the superheater is insulated along with many of the other steam and hot water lines associated with the car. The boiler is wrapped in a thick blanket of insulation and the smokebox is also well insulated to contain the boiler heat. The superheater ring and the side walls of the burner contain high temperature insulation for heat control as well. Original Stanley Steam cars relied on asbestos for insulation of the boiler and steam piping. Today repairs are made with "refractory ceramic fiber". This form of insulation is spun from Alumina (Al2O3) and Silica (SiO2). It is available in various forms including blankets, felt, and paper. Generally the blanket form is used for insulating cavities such as the walls of the burner and the smoke box. The felt can be used for the sides of the boiler while the paper form provides a strong durable top covering to the outside surfaces of the boiler. Pipes may be wrapped with various widths of ceramic fiber tapes and some manufacturers offer ceramic fiber sleevings that can be slid over steam tubing to insulate it. While there are numerous high temperature adhesives available to secure insulation blankets and tapes in place, simple heavy-duty wall paper paste works well, is inexpensive, and is what the Stanley's used originally. The blanket form of the insulation may be held in place by the walls of the cavity it is used to fill such as the inner and outer steel walls of the burner. The felt versions can be held in position with wire and then a layer of the paper insulation applied to give a smooth surface. Ceramic fiber paper can usually be dipped in water and then formed to the surfaces is covers making it look like the original Stanley asbestos insulation. Where it is necessary to secure the insulation in place and provide a smooth surface, such as covering the exterior of the boiler, the same methods used at the Stanley Factory may still be employed. Simply coating the surface the insulation is to be adhered to with wall paper paste and then placing the insulation in place is all that is needed. For sealing around the various pipes at the top and bottom of the boiler the blanket material can be shredded and mixed with wallpaper paste and then the resulting material formed to fit the opening to be covered. For insulating steam pipes a roll of ceramic fiber tape works well. The pipe can be coated with wallpaper paste and then wrapped with a layer of the paper insulation. For extra protection a layer of the braided or woven tape form of ceramic insulation may be used similar to what is available for automotive exhaust headers. The steam loop shown in the photograph is insulated with two layers of 1/8" thick by 1" wide ceramic fiber tape wrapped around the pipe and adhered to the pipe with simple wall paper paste. An overall covering of a woven tape similar to what is used on automotive exhaust headers has been applied since the woven material provides better abrasion resistance and durability than ceramic fiber tape. There are numerous manufacturers of ceramic fiber insulation products. One of the better-known manufacturers is Unifrax (www.unifrax.com) who manufactures the Fiberfrax line of ceramic fiber insulations. Another manufacturer with a diverse line of products is Thermal Ceramics (www.thermalceramics.com) marketed as Kaowool Refractory Ceramic Fiber.